Penelitian - Researchers have discovered a way to grow human stem cells destined to become mature sperm in an effort to provide fertility options later in life to males who are diagnosed with cancer and undergo chemotherapy and radiation as children. "For years researchers have been trying to find ways to grow and expand these cells from testicular biopsies donated by young patients prior to their cancer treatment, but until now, there has not been a consistently successful approach," said Sandra Ryeom of the University of Pennsylvania. "We have never had any fertility preservation options for prepubescent boys. The findings in this work are a great first step forward for our youngest patients," said Jill Ginsberg, of the University of Pennsylvania. Researchers have known that the production of sperm could be restored in mice that were sterilized after treatment with the chemotherapeutic agent busulfan by injecting immature sperm cells from a donor into their seminiferous tubules--located in the testes. Oncologists suggested that SSCs might be harvested from boys before the start of chemotherapy and reintroduced into their testes when treatment was complete. Given these challenges, the team identified testicular endothelial cells as a critical niche population for the maintenance and expansion of human SSCs in the lab. 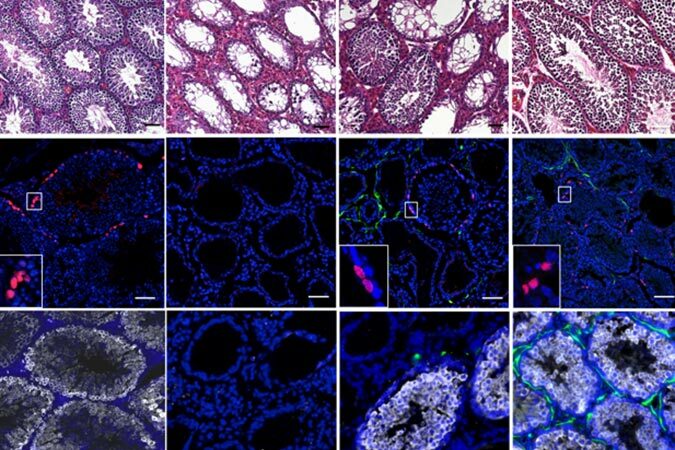 More importantly, they also identified five growth factors produced by testicular endothelial cells that are necessary for keeping human and mouse SSC cultures alive over the long term. Eventually patient samples could be expanded then frozen until needed.